Who has tried WAN Health with Meraki Insight? You can read the latest blog post here. In addition to being able to monitor and troubleshoot web-based application performance (Office365, Salesforce, Dropbox, etc. ), you can now also monitor & troubleshoot the status of your WAN uplinks. Imagine you manage an organization with 100's or 1000's of sites, and you want to sort by the lowest performing sites, and then use that data to troubleshoot with the ISP. For those who've tried it, I'm curious to know what your experience has been so far? The sorting idea is a good one. So far I have only had clients buy Insight licences for the DC MX's and a handful of branches, and they just move the branch licences around as they get complaints. So I haven't really had an option to really use the sorting pro-actively. Have played around with it ... definitely very much in beta (as it states on the web interface). The one thing that I didn't like is that you have to run latest Beta code on MX to even enable the feature - there is no mention of that anywhere and Meraki doesn't consider that to be a major issue after talking to them... I disagree. Amazon, Office365 and others seem to be accurate so far.... the web interface though takes a long time to load up once you have 10-15 monitored applications. I've been playing with insight and I do like it over all. With everything I am juggling during the day, one thing I find a little annoying is the need to go and look at that information. I would love to be able to set up alerts for WAN Health and other aspects of Insight. It would also be nice to have WAN health keep track of the circuit over the past 7days+ and let me know if the current state is out of the norm. With some ISPs in the USA latency can routinely be higher than I'd like and having Insight let me know when it was out of the norm would be very helpful. @pstewart Interesting and good feedback. By the way, the new MX platforms (MX67, MX68, Z3C) are running MI in stable GA firmware, but I’m guessing you’re running on another platform, where it is still in beta. I would like to understand some of your thoughts in more detail. Would you be available for a quick chat with the PM team? I am really confused, where do you find WAN health? When reading about the new feature it said one of my networks supported it, but I could not find the option anywhere. There is little information about this on the Meraki site other than screenshots, which don't tell you where to go on the dashboard. 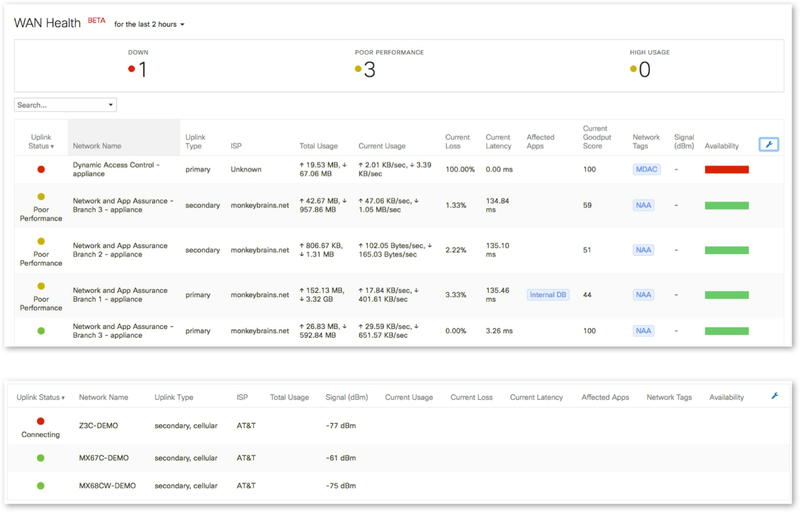 @Aaron_Wilson You need to have a Meraki Insight license. Once you have a license for that you can go to "Insight > Configure > Licensing" in the menu on the left of your dashboard window and apply the license to a network with an MX appliance in it. Well that's confusing @MacuserJim because in the dashboard it says "Switch to one of your applicable networks to check it out:" and shows me one of my networks. That is strange. And you're sure you don't have any Insight licenses in your dashboard, even trial licenses? You may want to call into support and ask about that and see if there is something quirky going on in your dashboard, if something is getting missed, or to clarify a bit. If Insight is suppose to be top-left corner above org, no I don't see it. Nothing under my licensing section either. All the SKUs can be found in this document. I am on the trial key for two months and will make a decision soon. Overall, the quality of information is very good. a) the span of data collection is only 7 days. I am looking forward to seeing up a month. b) some of the information is unclear. such as: Total network usage under LAN: Is it the total usage of the entire network or just a specific application. The Respnse time: to where ? to the specific server for the Application or google in general? Thank You for your feedback on this. any usage activity you look at in the "View Trend" (Network / WAN / LAN / Application) tabs are for that specific application related traffic. For instance, in the example you mentioned, it is total usage of your network related to the application you are tracking. The response time on the client tab shows the time to the Specific Server and not to the google in general. A variety of folks here at Meraki who are responsible for / interested in Insight will be keeping an eye on the board, so do please post your questions and suggestions there.